Linsey Pollak plays and loops “”Mr Curly”” (a contra bass clarinet made from narrow bore garden hose) and a feather duster sopranino clarinet. Linsey Pollak is an Australian musician, instrument maker, composer, musical director and community music facilitator. He has recorded 31 albums, toured his solo shows extensively in Europe, Nth America and Asia as well as performing at most major festivals around Australia. 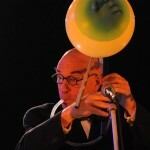 Linsey has devised many large Festival pieces such as “BimBamBoo” and “Sound Forest”, as well as collaborating on many music and theatre projects around Australia. He established The Multicultural Arts Centre of WA, and has co-ordinated five Cross-cultural Music Ensembles in three different States. Linsey has also worked as a musical instrument maker for 40 years and has designed a number of new wind instruments as well as specialising in woodwind instruments from Eastern Europe.